Working hours of post offices are from 8.00 am to 6 pm. You can buy stamps and post cards at the post office desks as well as from newspaper kiosks. Single stamp for delivery inside Bulgaria costs 0.45 leva (~£0.16). International postage vary according to destination. There is a center of communication services of BTC (the Bulgarian Telecommunications Company) at the BTC regional headquarters at 2 Suborni Blvd. It offers various communication services: phone calling, faxing, e-mail and is open throughout the day till 11 pm. There are two different phone-cards operators: BULFON – the orange phones and MOBIKA. – the blue phones. The companies offer phone cards of different units from 25 to 200 (2.90 to 13 leva / ~ £ 1.01 to £ 4.55). You can buy phone cards from post offices, kiosks and other street vendors. There are three mobile operators in Bulgaria – Globul, MobilTel & Vivacom. All of them have sufficient coverage throughout the country. Every operator has prepaid service cards which does not involve contract signing. Upon request your operator will gladly give you information about phone calling from a mobile phone in Bulgaria. All medical establishments in Bulgaria perform medical checks, tests and treatment of foreigners. Foreigners pay for the medical services in exchange of an invoice in Bulgarian levs in cash at the cash desk of the medical establishment or else with a bank transfer from abroad. There are numerous banks in Varna both Bulgarian and foreign. There is also a branch of the Bulgarian National Bank. Working hours of banks is from 9.00 am to 4.00 pm. You may change cash in banks or in the numerous exchange bureaus many of which are open on weekends, too. Some of the exchange bureaus charge additional commission though. Eurochecks may be cashed in many of the banks. There are many ATM terminals as well as POS across the city and the bigger supermarkets, petrol stations and stores. Many of the world famous global courier services are to be found in Varna like TNT and DHL as well as local ones like City Express and Econt. holidays it is advisable to contact them in advance. In this way you will find what you seek within the highest possible choice. Unlike the recent communist past with just a relay station and a local TV studio of the central state television Varna is nowadays the second major tramsmission city in Bulgaria with various radio and TV programs available. It is the headquaters town of the MSAT sattelite television which informs its audience about world, domestic and Varna news and events.You can hear various FM radiostations in Varna – currently about 18. 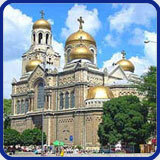 There are many firms that offer taxi services in Varna. You can arrange a taxi to take you from address, bus stop or even in the street by calling to the appropriate telephones from any public phone. There are numerous rent-a-car companies in Varna. Information is also available at hotels and tourist agencies. To drive in Bulgaria you need an EU driving licence and a valid insurance card. Petrol filling station with all types of fuels used as well as gas stations are to be found in all towns and along the roads. after 11 pm in summer time.